by using the web as your telephone line!!! All you will need to join in is a soundcard, speakers and a microphone. Regards to the men, love to the women. it necessary to create a separate page that lists all of the sources!! death references come from newspaper articles since the 1700's until the present time. Here's my family tree which we traced back to James Differs who married Helen Henderson in 1814. Innes Duffus and I have come to the conclusion based upon our research that the all members of the Differs family which came from Errol, Scotland, just a few miles east of Dundee all changed their names to Duffus during the 1800's. 2. i. JOHN HENDERSON2 DUFFUS, b. November 08, 1815, Dundee, Forfar, Scotland; d. January 19, 1896, Dundee, Forfar, Scotland - Western Cemetery on Perth Rd..
3. ii. JAMES DUFFUS, b. August 10, 1817, Dundee, Forfar, Scotland; d. November 14, 1873, Cause - chronic bronchitis, vesticular, emphysema for years. iii. 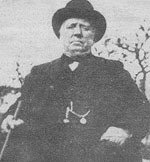 WILLIAM DUFFUS, b. October 10, 1819, Dundee, Angus, Scotland; d. 1865, Dundee, 1st District, Angus, Scotland. iv. DAVID DUFFERS, b. October 22, 1821. Named after paternal grandfather David Henderson - source Dundee Baptismal records. I enclose herewith my request for provisional registration - provisional because my being at the Gathering depends on my being able to find a single room. You may not be aware that there is a dearth of these and when Elgin knows that there is to be an influx of people for anything so specific as a gathering, coming up to summer time, they will not be willing to allocate doubles as singles. This story is usually "If you come back after 10 p.m.----" One other thing regarding the proposed payment -- wouldn't it be possible for you to open an account here and authorise someone to collect for those who live here? It would save some conversion charges. 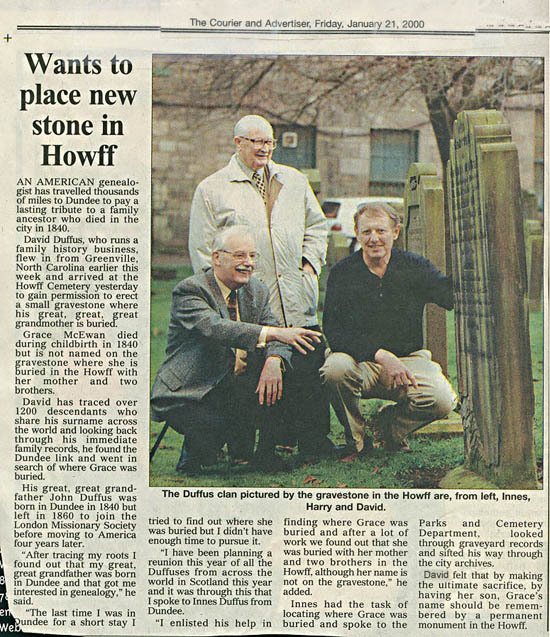 I learned about the event only when I saw you photographed in the Howff flanked by Harry and Innes, one of whom I have since met. Harry has shown me some of the material you sent him which leaves me almost speechless. I can add a little but at present I am hounded to death (you must brush up on your Scots) with property problems and the aftermath of my accident (Oct.98) when my car was totaled and my insurers have let me down badly. No injury but nothing but hassle since. I enclose a tree which will give you some idea of my credentials. My Doigs are a dead loss literally and metaphorically. I should have concentrated on Duffuss and Tyndalls. I might then come up with some living relatives, however distant. I had Latin at school and University and I felt that the plural of Duffus should be "Duffi!" I look forward to meeting friends from across the pond which my father crossed many times as a marine engineer with ATL. They broke up the ships in 1934 and five years later, wished they had them - ships and engineers. The result in terms of employment was not much different from the Clearances. With all good wishes for the success of your project. 3. JAMES3 DUFFUS (ALEXANDER2, DAVID1). He married JEAN SOUTAR April 15, 1819.
i. JEAN4 DUFFUS, b. February 03, 1820. 5. ii. 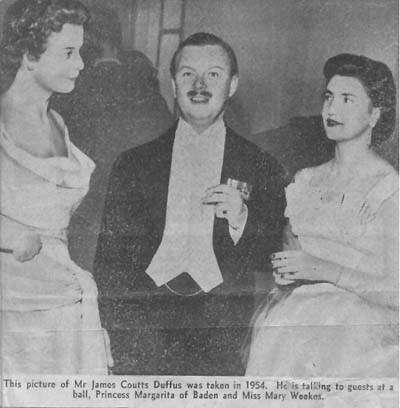 JAMES DUFFUS, b. March 06, 1822; d. December 03, 1916. 6. iii. AGATHA DUFFUS, b. August 12, 1823; d. May 09, 1899.
iv. THOMAS DUFFUS, b. January 13, 1825.
v. EUPHEMIA DUFFUS, b. September 01, 1826.
vi. ELISABETH DUFFUS, b. October 29, 1827. 4. ELISABETH3 DUFFUS (ALEXANDER2, DAVID1) was born May 05, 1803. She married JAMES PRINGLE. i. JOHN4 PRINGLE, b. 1842.
ii. 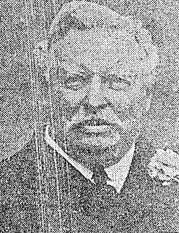 JAMES PRINGLE, b. 1844. 5. JAMES4 DUFFUS (JAMES3, ALEXANDER2, DAVID1) was born March 06, 1822, and died December 03, 1916.He married ANN COUTTS September 19, 1848.
i. JAMES5 DUFFUS, b. 1850; d. May 01, 1904.
ii. AGNES FRANCES DUFFUS, b. 1852; d. May 07, 1917; m. STRUTH?. iii. JEANNIE DUFFUS, b. 1855; d. February 25, 1883.
iv. ANNIE COUTTS DUFFUS, b. September 19, 1855; d. April 07, 1924.
v. MARY STEELE DUFFUS, b. August 02, 1857.
vi. BETSY DUFFUS, b. 1859.
vii. EUPHEMIA DUFFUS, b. September 16, 1861; d. February 20, 1938.
viii. JOHN COUTTS DUFFUS, b. February 14, 1861; d. January 25, 1933 at Penniwells, Elstree, Herts. ix. MARGARET MITCHELL DUFFUS, b. January 19, 1866; d. June 05, 1967; m. GOLD. 6. AGATHA4 DUFFUS (JAMES3, ALEXANDER2, DAVID1) was born August 12, 1823, and died May 09, 1899. She married DAVID TYNDALL November 15, 1850.
i. JAMES5 TYNDALL, b. 1853, New York, USA; d. February 13, 1923; m. LIZZIE ROBERTSON. ii. JANE TYNDALL, b. 1856, New York; d. December 30, 1875. 7. iii. ANDREW TYNDALL, b. 1857, New York; d. 1881, Dundee. 8. iv. AGATHA DUFFUSTYNDALL, b. August 28, 1859, Monikie; d. August 25, 1948.
v. CHARLES BURNET TYNDALL, b. February 13, 1862.
vi. DAVID TYNDALL, b. February 09, 1864; m. BERTHA MORRISON, December 1938, 80 Oakdale St., Roseland Gardens, Brockton, Mass..
vii. GEORGE TYNDALL, b. September 27, 1867; d. March 08, 1914.
viii. MARY HELEN TYNDALL, b. April 23, 1871; d. January 14, 1872. 7. ANDREW5 TYNDALL (AGATHA4 DUFFUS, JAMES3, ALEXANDER2, DAVID1) was born 1857 in New York, and died 1881 in Dundee. He married EDZELL 1871.
i. ROBINA TYNDALL6 COPELAND, b. May 17, 1876. 8. AGATHA5 DUFFUSTYNDALL (AGATHA4 DUFFUS, JAMES3, ALEXANDER2, DAVID1) was born August 28, 1859 in Monikie, and died August 25, 1948. She married JAMES DOIG June 14, 1883. 9. i. AGATHA6 DOIG, b. February 02, 1881.
ii. DAVID DOIG, b. 1883; d. July 04, 1962. 10. iii. WILLIAMINA DOIG, b. 1885; d. February 23, 1920.
iv. ROBINA YOUNG DOIG, b. April 07, 1887; d. May 07, 1887. 11. v. PERCIVAL DOIG, b. October 24, 1890; d. September 07, 1951. 12. vi. MARY (MAY) DOIG, b. 1893; d. October 18, 1939, Whiting, Indiana. 13. vii. JAMES DOIG, b. 1895; d. Whiting, Indiana. 9. AGATHA6 DOIG (AGATHA5 DUFFUSTYNDALL, AGATHA4 DUFFUS, JAMES3, ALEXANDER2, DAVID1) was born February 02, 1881. She married COLIN GRIEVE. 10. WILLIAMINA6 DOIG (AGATHA5 DUFFUSTYNDALL, AGATHA4 DUFFUS, JAMES3, ALEXANDER2, DAVID1) was born 1885, and died February 23, 1920. She married DAVID L. BRODIE. 11. PERCIVAL6 DOIG (AGATHA5 DUFFUSTYNDALL, AGATHA4 DUFFUS, JAMES3, ALEXANDER2, DAVID1) was born October 24, 1890, and died September 07, 1951. He married ANNIE RITCHIE ROBB July 28, 1921. 12. MARY (MAY)6 DOIG (AGATHA5 DUFFUSTYNDALL, AGATHA4 DUFFUS, JAMES3, ALEXANDER2, DAVID1) was born 1893, and died October 18, 1939 in Whiting, Indiana. She married ANGUS MCLEOD. 13. JAMES6 DOIG (AGATHA5 DUFFUSTYNDALL, AGATHA4 DUFFUS, JAMES3, ALEXANDER2, DAVID1) was born 1895, and died in Whiting, Indiana. He married ETHEL. This gentlemen must have been the grandson of James Coutts Duffus b.1850. Click on picture to read article!!! 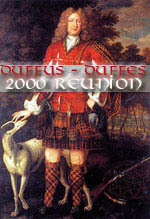 The Duffs are descended from those original Gaels who inhabited the Highlands of Scotland long before the Roman Invasion, and before the Christian era. Their ancient Gaelic name, Dhuibh, is pronounced Duff, and signifies a dark complected man with dark hair. The first Scottish Highlanders were members of the ancient German Tribes who crossed over the German Ocean and settled first on the east and north coast of the barren Island of Caledonia, later moving inland. They were of the Chauci, Cimbri, Suevi, Catti. and others, all fair complected with either red or brown hair, and of a 91ant stature and enormous endurance. The people of Britain and the lowlands of Scotland were originally from France and southern Europe, but the Highlanders from the beginning, kept themselves apart, and did not mingle with the lowlanders, whom they hated. The first Official Record of the Thanes of Fife was in the year 838 A.D. At that time Kenneth MacAlpine, who bore the blood of both Pictish and Scots-Irish Kings in his veins, had united two warring nations under one rule in the name of Scotland. When he appointed his Governors for the several Provinces, Fifus Duffus, or Duff of Fifeshire was appointed Governor of Fifeshire. In 1039 Queen Gruoch's (travestied by Shakespeare as Lady Macbeth) second husband King Macbeth, Mormaer of Moray - who also belonged to the House of Duff slew King Duncan and seized upon the Throne, and when Duff, the Thane of Fife, vowed that he would !I not be ridden with a snaffle" and failed to aid in building MacBeth's Castle, the pretender swore vengeance and drove Duff, the Thane of Fife, into exile. Duff hurried to England to join forces with -Malcolm, young son of King Duncan, and now that he had reached maturity, prevailed upon him to return to Scotland and take for himself the Throne of his fathers. Malcolm vowed to give Monimuske to the Church of Saint Andrew if he were victorious and a few days later they moved west toward the enemy camp. Led by Malcolm Canmore and the three Mac Duffs, the royal forces came to the Spey river where they encountered Maelsnectan and his rebels. There were several skirmishes, but at last the Moray men saw that they could not stand against the King's army, and through the good offices of certain church men the matter was arranged and the rebellion quelled. Gillemichael, fourth Earl of Fife, witnessed the Charter of Holyrood granted by David the First, and Duncan the Sixth Earl. was one of the nobles who treated for the ransom of King William in 1174. A later Chief, William MacDuff, of Banff, was raised to the peerage of Ireland, as Baron Braco of Kilbride, and being descended from the ancient Thanes of Fife was also created Earl of Fife, and Viscount MacDuff, in 1759. James -MacDuff, a later Chief was raised to the peerage of England in 1859, and his line continue to reside at his mansion, Duffhouse, near Banff. Alexander, sixth Earl, married Princess Louise of Wales, and created Duke of Fife in 1890. The Wemyss family of Fifeshire, and Aberdeenshire, who took their name from Eoin mor nah Uamh, or Great John of the Caves, a Duff who lived during part of the twelfth Century. Wemyss being a corruption of the Gaelic Uamh, meaning a cave. Below the ruins known as MacDuff s Castle, on the coast of Fife, are caves containing Pictish drawings; and these in all probability gave rise to the local place-name Wemyss. It became the surname of a cadet branch of the Royal House of Duff, descendants of Gillemichael, who was the Earl of Fife early in the 12th century. When senior male lines failed, that of Wemyss became the Chief of Scotland's senior clan, although it never reverted to the patronymic of MacDuff. WEBMASTER'S RESPONSE - PLEASE SEE REVISED SCHEDULE! do you pronounce Ceilidh anyway? WEBMASTER'S RESPONSE - "CALE IG" and I'm probably doing an injustice to the Scottish pronunciation. I give a few URLs below, but you are opening a can of worms Bill! >earldoms, which was originally separate from the Kingdom of Scotland. >the Gaelic Chronicles. . .
own the Pictish kingdom, not a good basis for reading Pictish chronology. corruptions, changes & deliberate alterations explained. difficult to claim as Celtic - always described as 'probably Pictish'. land-management because it was so efficient. continued in Moray for longer. this parish" and "married by the Rev. Mr. William Gordon". Glasgow area where all of their (approx. 9) children were born. hurdle the Duffus world will really open up to me! Here is a copy in "Word" format. coincide with the event in July and she does not feel she will be up to going. Farmhouse, Arradoul, by Buckie, Banffshire Scotland. seem to have lost my original. HIS PARENTS IN COLORADO BUT TO NOT AVAIL. looked for a translation but could not find one. Some time soon I will be starting on my own family tree, when and if I finish it I will try to sent it to you. Firstly, let me introduce myself. I am Mary Helen Bayne nee Duffus,  My brother, William John Duffus, has already registered to come to the reunion 29th June to 2nd July. I live in London whereas my brother still lives in the North East of Scotland where we were both brought up. John's interest in the reunion has been registered through his daughter, Julie, who alas (but good for her) is now in Australia. Hopefully it is not too late to register my intention to go to the reunion with my husband. 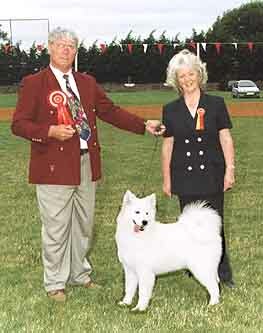 I have tried to register both my husband, Jim, and myself on the Duffus website but it has not been accepted. I don't know if this means there are problems with the website or if the registration is closed. Perhaps you could let me know on this e-mail address. My cousin, Alice Duffus (now Mrs Atkin), would also like to join the reunion along with her husband Peter and possibly their two children. We would plan to join the reunion party on Friday 30th June and participate until 2nd July. My husband, Jim, would be most interested in the Golf Tournament on the Friday afternoon. I am sorry I haven't been in contact before but I have only recently become fully aware of all the details. I do hope that there will be room for my party of possibly 6 (including myself and cousin, Alice, and family). As to the actual arrangements, I am a 'wee bit' confused about the payment for the Ceilidh. Your e-mail of 21st February seems to suggest that payment should be made when we join the reunion. However, the registration form indicates that the money should be sent to you now. Again, perhaps you could let me know how you want payment to be made. Finally, some other information about me. IOU £40 for the caelidh tickets which I will settle when we arrive on the Friday. PS hope that all is well and looking forward to meeting you - now just hunting for somewhere to stay!!!!! wife's name is spelt (& pronounced) ORLA (Irish) not Ola and I am C. D. H.
>Will try to answer your letter this weekend! all be attending the gathering. brother of Gordon Duffus from Chester, VA.
will not be able to join you for the Duffus reunion.